Fresh Turmeric Curry is one of the popular dish in Rajasthan. 1. Wash and scrape the turmeric. Again wash turmeric and grate. Keep aside. 2. Chop tomatoes, green chillies and cilantro. 3. Combine one tomato (chopped), green chillies and ginger in a blender and blend into smooth paste. Keep aside. 4. Heat a tsp of ghee in a pan, add grated turmeric and fry them till brown and crispy. Transfer into a plate. 5. Fry green peas in same pan for few minutes. Transfer into a plate. 6. Add remaining ghee into the same pan and add asafoetida, cumin seeds. Now add crushed peppercorns, cloves and cinnamon. Add fennel powder and coriander powder. Fry them. 7. Add tomato - ginger paste (step 3). Cook for few minutes in medium heat. 8. Add Yogurt mix well and cook for another 2-3 minutes in medium heat. 9. Once the gravy starts boiling, add chopped tomatoes, fried turmeric, green peas and salt. Mix well, cover the lid and cook for few minutes. 10. Finally add cilantro, mix well cover the lid, cook for few minutes and switch off the stove. 11. 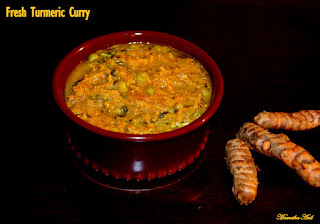 Turmeric curry goes well with chapati, roti and rice. Hi mamta, your blog is full of interesting recipes. They are what I like to eat n cook. Keep up the good work. Laurels, all the best.